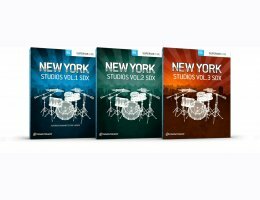 This collection comes with the full core sound library from the now discontinued Superior Drummer 2 as well as two SDX expansions from the same series, the New York Studios Vol.2 and Vol.3 SDXs. The focus of the series has been to capture the most notable and legendary drum rooms in the New York area: Allaire Studios, Avatar Studios and The Hit Factory. Having housed acts like Aerosmith, Bon Jovi, Journey, Kings of Leon, The Clash, Stevie Wonder, U2, Paul Simon and Michael Jackson over the past several decades, all three studios have left vivid footprints in modern pop and rock history. Sadly, two of these landmark facilities have since closed. In that respect, these drum libraries are historical documents of their unique sonic identity. All sounds were recorded by Grammy Award-winning engineer Neil Dorfsman (Dire Straits, Bruce Springsteen) together with Pat Thrall (Katy Perry, Beyoncé) as well as in-demand session drummer Nir Z (Genesis, Chris Cornell). In total, you get approximately 50 GB of raw, unprocessed drum sounds captured in meticulous detail in three essentially different drum rooms, each with their own distinguishable characteristics. This collection is the perfect palette to use when crafting drum tones for anything from loud and reverberant to soft and intimate – something only perfectly crafted drum rooms can facilitate. Combined with the abundance of sound shaping and sound design tools available in Superior Drummer 3, this collection of drums offers a near endless palette of drums to shape into your mixes. This is the classic core library from Superior Drummer 2, a collection of sounds that over the years have become an industry staple used by countless top producers and heard on major label records, in commercials and movie scores. It was recorded at the legendary Avatar Studios, a classic New York studio especially known for its amazing tone for drums. Since its inception in the 1970s, Avatar has recorded bands and artists like Aerosmith, Bon Jovi, Journey, Kings of Leon and The Clash. The Allaire Studios and The Hit Factory. These two landmark facilities have hosted the who’s who of popular music for decades – anything from David Bowie to Stevie Wonder, Michael Jackson, The Rolling Stones and Paul Simon. Since the recording of these sound libraries, both studios have tragically closed their doors to the public and thus, the legacy of their signature sound lives through their respective body of work, but now also vicariously through these very drum recordings. In the third volume, we revisit the Avatar Studios to bring you a new collection of drums, completely different from the ones available in the first volume. Combined, these two recordings give you a broad palette of drums recorded in one of the world’s premier locations. 6 complete kits, 26 snares & 14 kicks in total? A large amount of cymbals?